The NEW Iron Man 3 Movie is on HOT! From what I hear, its gotten GREAT reviews. How would you like to see the movie for FREE?? 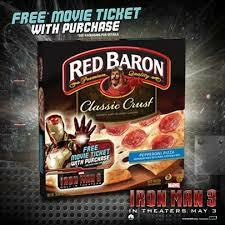 Right now, when you purchase 4 Red Baron Pizzas, you'll score a FREE Iron Man 3 Movie ticket. Hurry over to the Red Baron Facebook Page to learn more.